Winter is almost here and I'm feeling festive! Brand new to Crystal Allure Jewelry are two handcrafted winter beaded jewelry pieces that are perfect compliments to the upcoming holiday season and the beauty of wintertime. For a delicious treat (without the calories! ), try this new handmade beaded necklace! This beautiful beaded necklace features a mouth-watering red and white 'peppermint twist' glass lampwork pendant accented with candy colored Swarovski Crystals and white seed beads. And if you love wintertime and the shimmering beauty of newly fallen snow, you won't want to miss out on the snowflakes inspired bracelet above! 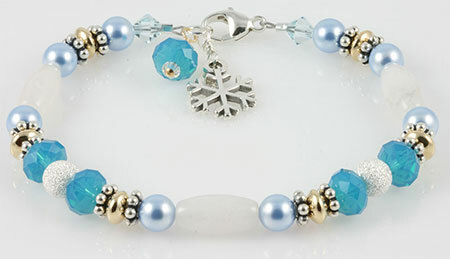 Jack Frost blows the chilling wind your way in this handmade beaded bracelet featuring snow jade gemstones, shimmering blue Swarovski Austrian Crystals, pearls and a lovely sterling silver snowflake charm. 14 karat gold fill beads are mixed with sterling pave' style stardust beads that mimic the twinkling snow on a sunny winter day. Both of these pieces are one of a kind designs and are finished with our sterling signature jewelry tag. 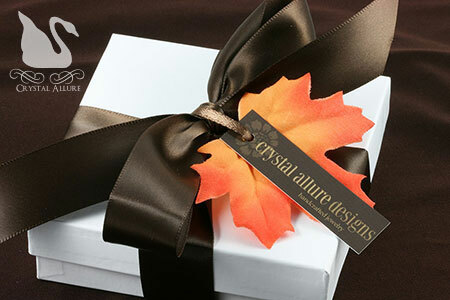 For today only, Cyber Monday 2009, you can receive 25% off your total order when you shop at CrystalAllure.com. Just use code cybermon at checkout to receive your 25% discount. There is no minimum order needed, but you cannot use the discount in conjunction with any other offer, on sale jewelry or custom jewelry requests. The term Fiesta is Spanish for "festival" or "party". But you might be more familiar with the Fiesta dinnerware. The bold dinnerware comes in bright, vivid colors. 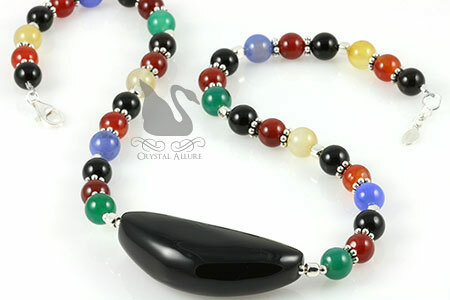 This stunning beaded necklace features a generous 50x20x15mm lightly-banded black onyx gemstone pendant accented with a colorful array of Indian agate gemstones, .925 Bali, beads and sterling silver. At a princess length at 18-1/4". It's the perfect complement to any neckline. Any gemstone necklace is unique in its' own right. On this particular necklace, the unique curve-shaped onyx pendant is a bold focal point. The Fiesta Black Onyx Indian Agate Gemstone Beaded Necklace (N092) is a great piece to add a shot of color to your fall wardrobe. This handmade beaded necklace is a unique one of a kind piece of jewelry. If you would like matching earrings simply contact me for availability. Black Friday Shopping -Bad or Not? Well, I finally did it. After 40 years of avoiding Black Friday, I finally caved this year and did it. And you know what? It wasn't so bad -or at least not as bad as I think I built it up in my head. Each year I wondered why anyone would feel the need to go out on the one day of the year when it was probably the most stressful time to shop and well -shop. It baffled me. I'd hear stories -people grabbing things, fighting other people for things, the best stuff sold out (that you had your heart set on) -on and on, the stories would flow each year. And I'd sit back and think -HA! my shopping is nearly done (because you see, I'd start shopping in August...all to avoid the holiday crowds and angry shoppers), and I'd do a lot of shopping online. At first, people thought I was nuts but then would have to agree -avoiding as much holiday shopping after Thanksgiving was actually smart. Although in fairness, I think as the years have gone by, stores have gotten smarter about how to manage Black Friday and I think for the most part it's worked. And so far, I haven't ever really been all that interested in the "big" ticket items that are so hot the day after either. But this year was different, I mentioned it to my husband and he thought -righhht, you're gonna get up...we'll see. So I said set the alarm and we'll take it from there. The alarm went off promptly at 5:00 am and he asked if I was getting up -I confirmed in my half groggy still asleep state. It was another 15 minutes but I did get up (but, shhhh....let's not talk about how I can't get up for work!). After getting ready, planning the stores we'd hit and the order, we headed out into the morning darkness. My philosophy -I'm a bear -if it's still dark, you should be sleeping. BUT, I was amazingly out of the house and at the first store by 6am. Yikes! We hit five stores in total and got pretty much what we went in for. Of course, we also had options. We were buying for our nieces and they had already marked items in the sale ads of things they'd like for Christmas. In fact, we were also pleasantly surprised that many people were pretty pleasant (certainly not the type of holiday shopper I had built up in my head all these years!). At one store, there was one person who did grab onto the same item I was already trying to get off the hook -but it was a rush for that one item and when she realized I was not letting it go (meaning, maybe moving it out of the way for another color), she quickly let go and apologized. In the end, it was a pleasant experience that I got to share with my husband. The holiday shoppers were pleasant, we got what we went out for, and there are now at least three less family members to buy for (of course, it didn't hurt to be out since I did pick up a few things for myself!). So that is where I have been. Not MIA, but preparing for Thanksgiving and doing some early shopping. 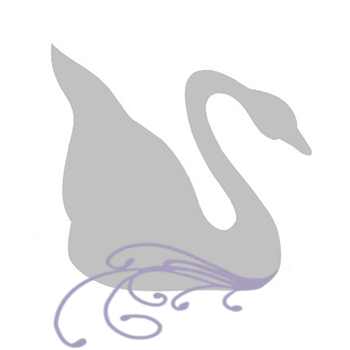 But I'm back and new designs will be added to the online jewelry store by Sunday evening -I promise. Now, off to make more pies for a second (and last) family Thanksgiving dinner. So how was your holiday? Did you go out shopping on Black Friday? Did you get what you wanted? What was your shopping experience like? Leave a comment. Earlier this month, we finally received our new shutters and recently just got them all up. 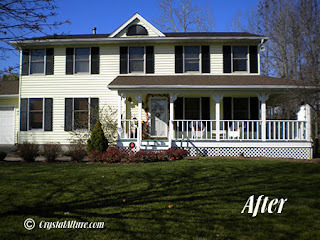 When we first purchased our house eight years ago, the house had white shutters and a white door with brown trim, no landscaping other than junk "mulch" piled up to the top of the porch and no back deck. Even inside the house, we've done so much. The walls still had the original builders white-ish, gray paint on them. The previous owners had had the house built and lived here about 11 years (?) prior to us purchasing it. Eleven years and not once painting. I personally, just don't get that but hey, what-eva. So we are only the second owners of this lovely colonial house. In the past eight years we have done sooo much to this house, both inside and out. I thought it would be great to share our "re-decorating", room by room. Well, since this was actually my first house, we have probably redecorated a few rooms more than once already. I love to decorate and always have tons of ideas. But in the last year, I guess you can say I've focused in more on redecorating to the style of the house (colonial) while continuing to add our own personal touches. Now that we have started doing this, I hope to show before and after pictures when ever possible. But there might be some rooms where I just never thought to get the before, so you won't get the full impact of the change, but you'll get the idea. It is not our plan to go full colonial style, just use it as a basis by which to design and decorate our house after. A touch of yester-year, if you will. Most recently, were the shutters. It's sort of a conversation piece really (our house), because it is a bright yellow -not muted, trust me bright yellow. When we first moved here I suggested getting black shutters but my husband nixed that idea saying he didn't want a bumble bee looking house. So, I opted for a soft sage green. We cut costs by spray painting the white shutters and front door to a lovely shade of sage green. What made our colonial house even more beautiful was the fact that it had a wrap around porch with 3/4 gazebo at the end of the side. In this first picture, we still had our summer flowers in bloom and you'll notice a very large tree at the corner of the house. This tree, although lovely and provides great privacy of the porch, really takes away from the wrap around porch. Now that we have settled in and know what we want in our house decor, I had decided (again) we needed to go with black shutters and my husband has finally agreed. He's glad he did because he really likes how the house looks now. And we have many plans for the upcoming summer. For starters, the front door will also be painted black (this is a brand new door, as well) and we just never got to painting it before the cold weather settled in. You can also get a better glance at the porch with the tree having lost all its' leaves. We had our roof reshingled (well, my husband did the whole job -tear off and put on!) in a brown and had purchased new outside lights in brown, all this prior to deciding on the black shutters. It sort of bugs me but it's something I'll have to live with now. Although it's not too bad. You'll also notice between the two pictures that we have actually pulled some things from our garden near the house (mainly a small tree). This was in the beginning a full butterfly garden that I planned the layout myself. It was a great garden and one year we were visited by over six varieties of butterflies -it was so exciting! Our pathway was originally a square "L" shaped pathway and we hated it. 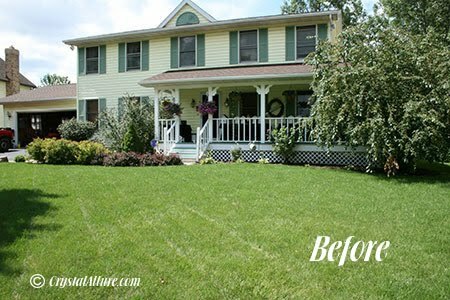 When we finally decided on an idea, we had had our our pathway re-done and landscaped in front, along with having some winter interest added to our yard -this was prior to both pictures. Well, when that was done, the landscaper did not know of my full butterfly garden and some of it was destroyed. It still has some elements for the butterflies but not nearly as many flowers as before. So both pictures above is what was left of the butterfly garden, the one large butterfly bush still remains but as I said, we pulled the small ornamental tree -to me it looked like a lollypop on a stick. Come summer, our plans are also to pull out the very large tree at the corner of the porch. For us, I think it'll be a big shock in how the house looks but we really want to highlight our wrap around porch, (1) because no one else in our neighborhood or surrounding neighborhoods have anything like this and (2) it is a unique feature on the colonial style house. It almost gives it a victorian style touch. Obviously once the big tree is pulled we'll have to come up with some landscaping to accent the porch, but not cover it up. 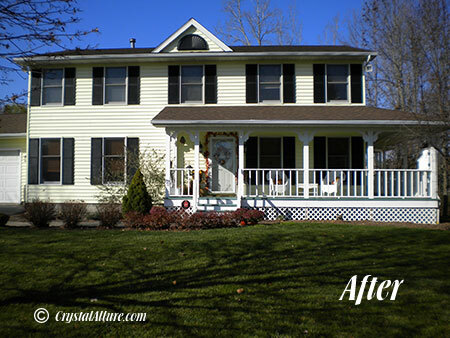 Our house is a project we love working on and I look forward to sharing our changes with you. So tell me what you think -leave a comment. My time in the studio this past friday consisted of the one goal to start clearing off my desk of unfinished projects. I must have had at least 20+ (that I could actually count) projects that needed to either be strung, complete the design or finished off and ready to be pictured. This doesn't even count the number of finished pieces that wait to be photographed! I have found that taking pictures can be a bit tedious, as a result, I tend to procrastinate on taking them. Which is why the online boutique has not been updated in, oh, 3 or more weeks? But, I did get alot accomplished -even with a migraine that lasted until three in the afternoon. I completed, ready for pictures, 6 or more pieces -one of which includes an anklet that I've had at least a year simply to get the charm wire wrapped on the anklet. Such small things, yet they sit while other designs are finalized. Well, not this past friday! There are still many more projects to finish and I hope to accomplish more this holiday week. But here is a preview of one of those new designs that will be posted in the boutique this week. Holiday week or not, I will be posting in the studio blog this week but wanted to wish you all, in advance, a fabulous Thanksgiving with your family. While you are digesting your tasty turkey, take a moment and check out CrystalAllure.com for all the great beaded jewelry that will be posting this week. While cleaning out our digital pictures file the other day I came across the pictures I took of a Christmas gift my husband lovingly made for me in 2004. Below are pictures of the handmade jewelry box my husband custom designed (and made by hand) for me that mimics the cut and details of my dresser. It is oak wood that was stained to match our existing bedroom furniture. I actually just noticed in picture #2 that it is slightly unfinished -he had yet to get the liner in there because he wanted me to choose the color I liked best. 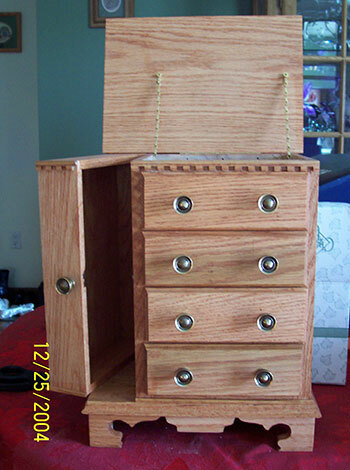 The end result was an absolutely beautiful handmade custom oak wood jewelry box for all my Crystal Allure Jewelry. Well, if the truth be told....it is no longer big enough to hold my personal collection of handcrafted beaded jewelry (or my fine jewelry), but I still use it! 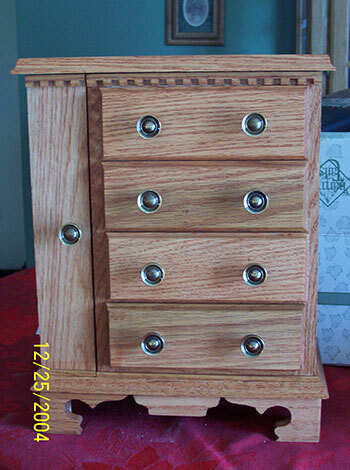 This custom handmade jewelry box was created using red oak wood with three functioning drawers, left side pull-out with small hooks to hold your handmade necklaces and a flip top compartment for all your beaded bracelets. The cut-out detail at the top is hand-carved dentil molding that carries over to the pull-out necklace side. 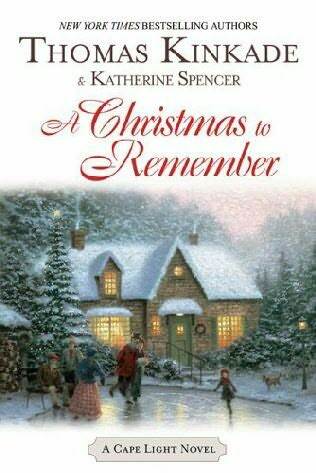 I just recently finished A Christmas to Remember by Thomas Kinkade and Katherine Spencer. The sad part....I've probably had the book for at least 1-1/2 to 2 years before actually picking it up and reading it. A short time ago, it just happened to work out where I was able to dedicate at least a half hour to an hour of time during the day to pick it up and read it. As some might say, "back in the day" I used to read books as if they were nutrition and I would starve if I didn't read at least one or two books a week. I loved reading. Then came college and I was "forced" to read. It made the reading experience not so enjoyable and it was during this time that I lost my interest in reading for pleasure. Then life took over and well, I just couldn't find the time. Hence the reasons why it took so long to read this book. I purchased it because it did look interesting and I am a fan of Thomas Kinkade paintings -so beautiful, so serene. The book was just as beautiful and by "beautiful" I mean...what's the word...nostalgic? I love winter (yes, I know I'm crazy) and I love Christmas (as I'm sure most of us do -especially if you remove the bad parts and focus on the good parts). If you let yourself and open up to the story you can almost feel a part of the tiny town and there are many elements in the story of that nostalgic feeling of Christmases' past. It definately leaves a warm feeling in your heart. It is one book in a series of I think about 10 other books written in storylines of different characters/visitors of the seaside hamlet of Cape Light. The next book I picked up in the series was A Christmas Visitor and I'm reading that now. I hope to have that done before Christmas. Wish me luck. It is because I spend so much time designing jewelry and running my business that I felt the need to take a step back and try to enjoy other facets of life (and to try and not be consumed by my beads!). This past weekend I went shopping with a good friend and she happened to ask me about my other projects (the basket weave crochet blanket and the chair reupholstering) and to date the status of both is -I've done nothing. See. I have great ideas and I would really love to do these...I just get side tracked or forget about them or well, everyday life takes over. So as we approach the holidays I do have some time off and although I will be baking, it is my goal to try and complete these or at least pick them back up again. Stay tuned for updates. Okay, okay -today is monday. But I had planned on posting friday, just got side-tracked. As you can see, I spent a good portion of friday working in the studio on the blog. I changed around the columns, tweaked a few widgets in the smaller columns, and added a few features. Now located at the end of every blog post are two buttons labeled, "tweet this" and "share". The first cool little button allows you to 're-tweet', if you will, the blog post on your twitter account -or share the post through just about any other social media using the second "share" button. I'm still working out some smaller quirks that bug me and some alignment issues, but I do like the fact that the first column is now the "reading" column -that's what'cha came here for right?! On another note. It really irks me when someone steals my entire web template, favicon and some photos from my web -just so they can take a short cut to start their own online store. You know what? I've spend years and hours upon hours (and not to mention money) on getting my site, brand and photos to where they are. Take the high road and stop stealing my hard work. I know who you are now and will be following you -oh yeah...and I reported you. Back in September a bride-to-be contacted me about our Red Aventurine Gemstone Freshwater Pearl Beaded Necklace (N040) to see if I had more than one in stock. She wanted to give them as gifts to her bridesmaids for her upcoming October wedding. Although I didn't have but one in stock because it was a one of a kind beaded necklace, I discussed creating a second similar necklace to give as gifts to the bridesmaids and to get the Red Aventurine Gemstone Freshwater Pearl Beaded Necklace for her maid of honor. That way, the maid of honor will stand out from the rest of the bridal party! I sent off small samples of the beads that would be used, since she really wanted her wedding jewelry to match with her fall themed wedding. The bridal party dresses where strapless with a sweetheart neckline in a rich chocolate brown color. Her wedding colors were to be brown and orange so these gemstones and style necklace were perfect for her wedding! In the days after speaking with her I got set off on finding just the right pendant and gemstone to coordinate with the existing necklace she planned on purchasing. What I found was a beautiful teardrop red aventurine pendant with a cut out in the middle. Instantly I pictured a single chocolate freshwater pearl dangling like a leaf in the middle. It was perfect! I was able to secure the same pearls and gemstones for the bridesmaids dresses and with some beautiful gift packaging, Sarah's Custom Bridesmaid Autumn Necklace Sets (N087) was sure to be a showstopper! The picture above is not of her wedding but it is a representation of how beautiful a fall wedding can be especially with a chocolate and orange color combination. The custom bridesmaid jewelry sets from Crystal Allure is pictured in the middle with my specialty packaging just for her wedding in the lower left corner (and enlarged above). 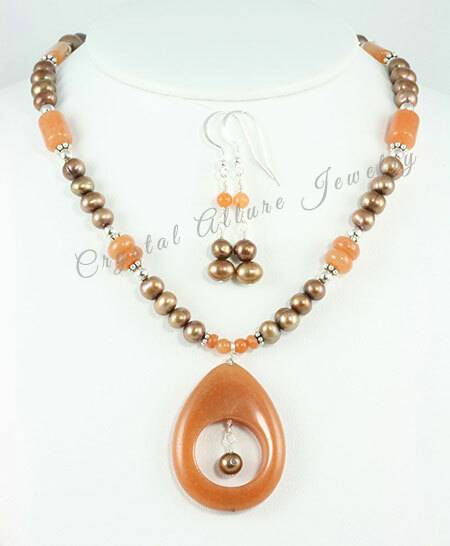 The bridesmaids jewelry sets feature a red aventurine teardrop pendant and throughout the beaded necklace with chocolate freshwater pearls. A single delicate brown freshwater pearl dangles in both the middle of the pendant and on the back necklace extender, for an exquisite finishing touch! These beads are paired with sterling silver Bali, beads, lobster clasp & extender chain making the necklaces adjustable 16-1/4" to 18". 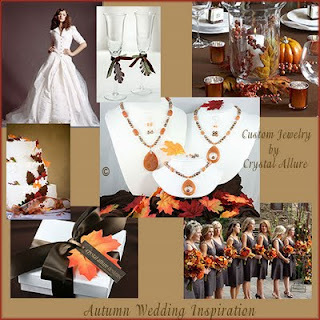 The warm brown and vibrant reddish-orange colors, reminds you of the changing leaves and the design complements the design of the Maid of Honor necklace. I'd love to design custom jewelry for your wedding, contact me for a free consultation. It seems almost impossible to combine the words, "bridal" with "memorial" -right? I would have thought the same thing but found recently that's not quite true. A very dear customer of mine approached me about designing a custom bracelet for a bride whose father had already passed away but asked her cousin (my customers' husband) to walk her down the isle. Here's the story of this beautiful bride gift from her mother in law..
Mary Kay's husband was asked by his cousin to walk her down the isle on her special day (her father had passed before her wedding day). She came to me to design a unique and special bracelet that he could present to her in honor of being asked to walk her down the isle. At first, it was difficult to come up with a design because I wanted to include both the honor of his being asked but also honor the memory of her father and still keep the design beautiful enough that she could wear it on her wedding day. It all came together when I found the sterling bali prayer box charm with the word "Dad" on the side. It was absolutely perfect! I am honored to have been chosen to walk such a special person down the isle on her wedding day. This bracelet symbolizes how I feel and although I am physically here for this honor, your father is here in memory. On this bracelet, handmade just for you, is a prayer box containing an emerald Swarovski Crystal in your fathers’ birthstone. 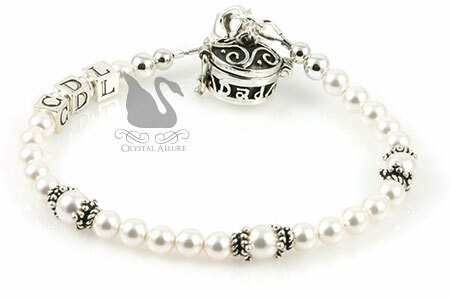 It also has three initials to symbolize that although I will walk beside you, your father will also in heart and spirit. We will both be “walking” you down the isle on this very special day. Both Mary Kay and her husband were absolutely thrilled with the design and special meanings behind the charm used and letter beads. And I am always thrilled and exceptionally happy to create a special jewelry piece that has meaning and will be cherished for a lifetime. Every other year or so, my husband and I will attend the local Nutcracker Ballet show. It's a beautiful ballet and perfect introduction to the surprise, excitement and beauty of the upcoming holidays. Personally, I've never professionally danced although when I was young I'd stand for hours on end at the local dance studio watching all the girls dance -wishing I could be one of them. Alas, it never happened. But to this day I still love the beauty and magic of the Nutcracker -the dancing snowflakes, the land of the sugar plum fairy, clara, the Nutcracker, well, the whole thing! When shopping recently at a bead show I came across the most beautiful natural ruby gemstones and knew I had to have them. It wasn't until I 'accidentally' set them next to my ruby quartz gemstones that the design immediately came to life. Once again, I dropped everything to work on this design and I added sterling Pave' style stardust beads that give the illusion of fairy dust floating in the midnight sky, as Clara danced. And because I love sharing my designs so much, I'm making Tuesdays -Two for Tuesdays! So for today only, purchase the necklace and get the earrings FREE!! No coupon needed, I'll automatically ship the beaded earrings with your order. Check out all the new beaded jewelry including beautiful holiday jewelry!